Access the Alsco job application by going to the company’s careers page. Several different types of job can be searched and applied for (across numerous locations). Learn more about Alsco’s online hiring process by reading the instructions posted below. About the Company: Alsco is an American laundry services company based out of Salt Lake City, Utah. The company was founded in 1889 and currently operates more than 170 branches throughout the world (providing services to more than 300,000 customers). Step 1 – The first step of the online job search process is to go to the company’s main careers page. 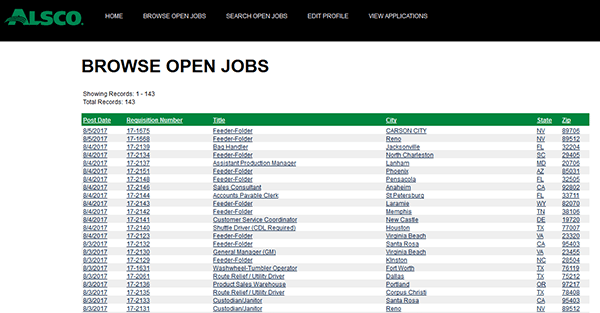 Click this link to have the current openings page load in a new tab/window. Step 2 – The list of openings can be sorted by post date, requisition number, title, city, state, or zip code. Click the link/title of the position that you’re interested in submitting an application for (to go go the next step of the process). 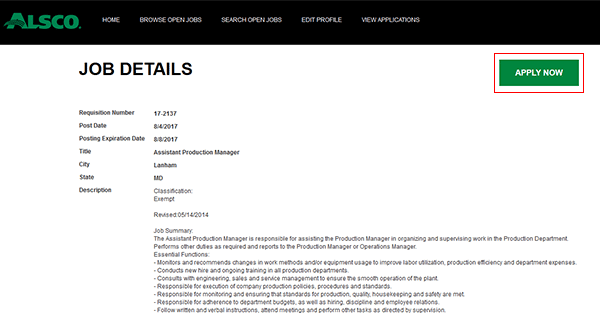 Step 3 – Review the job details page and then press the button as outlined in the below screenshot. Step 4 – Press the “Click here to create a new account” link if you’re a new user/applicant (otherwise sign in to your account). Step 6 – Click the “Next” button to create your account and go to the next step/section of the form. Submit any/all required details into each of the remaining sections of the application form. After all of the sections have been completed you will be able to submit your application.